A majority of Americans believe funerals and memorial services are a valuable and important part of healing after the death of a loved one – and that funeral professionals can help them meaningfully honor a life – according to the results of a nationwide online survey conducted from March 31 – April 10, 2015 among 1,238 U.S. adults age 40+ and 305 U.S. adults age 20-39 by Harris Poll on behalf of the Funeral and Memorial Information Council (FAMIC). 82% of adults over age 40 say a funeral service helps pay tribute to the life of a friend or family member. Among adults age 40 and older, 82 percent said a service was helpful in paying tribute to or commemorating the life of a friend or family member. Eighty percent felt services they attended had meaning and value and reflected the life of the deceased. In 2015, 72 percent believed services they attended were an important part of the healing process. 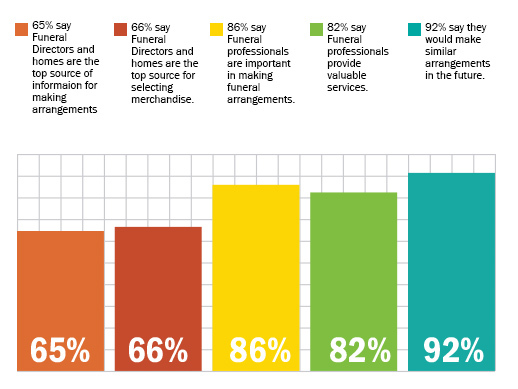 Funeral homes and funeral directors remain the top source of information for both making arrangements (65 percent) and selecting merchandise (66 percent) for adults over the age of 40; friends and relatives are the second most popular source of information for making arrangements (64 percent) and purchasing merchandise (59 percent). In 2015, 86 percent of adults over the age of 40 said funeral professionals were important in making funeral arrangements. Eighty-five percent said funeral professionals take special care to make the ceremony and arrangements reflect the wishes of the family. Eighty-two percent said people working in funeral services are professional and competent. Overall, 82 percent said funeral professionals provide valuable services. The majority of consumers would not change anything about their experiences with funeral homes – in fact, 87 percent of adults over the age of 40 who had previously been involved in selecting a funeral provider would choose the same one for a future need, and 92 percent would make similar arrangements in the future. For the 15 percent who would change something about their experiences with funeral homes, cost was the main concern (36%). This has remained a primary concern since 2004. Forty-six percent of adults over the age of 40 have had conversations with friends/family or friends about how they want to be remembered during their funeral or memorial service.  Regardless of whether they have engaged in a conversation with friends/family or not, 89 percent feel their family understands what has mattered most in their lives and how they have made a difference. Eighty-nine percent feel a discussion about their end-of-life wishes would be meaningful. In 2015, 69 percent of adults over the age of 40 indicated they would prefer to pre-arrange their own service; however, only 17 percent had made arrangements. Sixty percent of those who have pre-arranged their services have prepaid for some or all of them. The main reason for doing so (74 percent) was so survivors wouldn’t have to worry about them or pay for the services, potentially eliminating stress for their friends/family after they are gone. Of those who felt preplanning was important but had not yet pre-arranged services, 55 percent said they were likely to do so within the next five years. Only 34 percent of adults age 40 and older own cemetery property, down from 50 percent in 2010. Adults 40+ are highly interested in cremation, both for themselves (68 percent) and as an option they would choose for a friend or family member (65 percent). Saving money (22 percent) is the prime reason for choosing cremation; those who would not choose cremation attribute it to their own personal preference (30 percent). While more adults 40+ may be choosing cremation, they also want to honor the lives of their friends/family through a ceremony. Only 14 percent of those who prefer cremation for a loved one would choose to not have a funeral or memorial service. 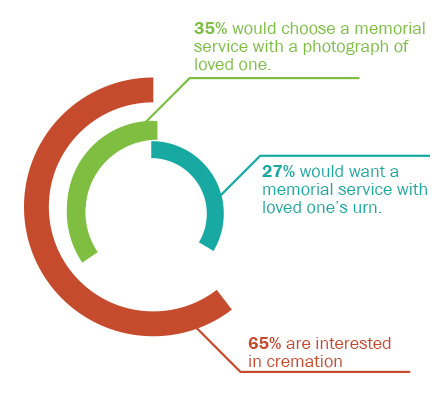 Thirty-five percent would choose a memorial service with photographs of their loved one present (the body would not be present); 27 percent would want a memorial service with their loved one’s cremated remains present in an urn at the service; and 25 percent would want a funeral with the body present in a casket prior to cremation. Awareness of green funeral options (options designed to have less of an impact on the environment and include things like biodegradable caskets and less use of chemicals in preparing the body for burial) remained the same as it was in 2010 – at 34 percent – however, interest has grown. In 2015, 64 percent of adults 40+ said they would be interested in green funeral options, compared with 43 percent in 2010. Adults 40+ are more aware of pet memorial services now (67 percent) than they were five years ago (57 percent), but consistently do not feel open to it (20 percent in 2015 versus 17 percent in 2010). Create or attend online/virtual memorialization sites (create a virtual memorial: 5 percent versus 2 percent of those age 40 and older; attend a virtual memorial: 39 percent versus 26 percent of those age 40 and older). 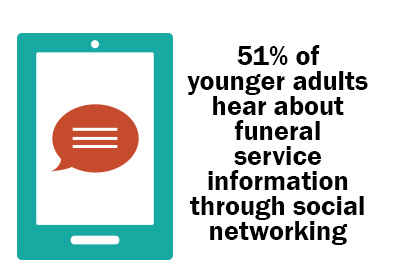 Hear about funeral service information through social networking, in addition to more traditional sources like obituaries (51 percent versus 23 percent of adults age 40 and older). Allow their friends/relatives to pre-arrange funeral/memorial options for them (42 percent versus 31 percent of those over the age of 40). Use the internet to “crowdsource” funds for funeral/memorial costs (17 percent versus 4 percent of those age 40 and older). The FAMIC study of the public’s attitude towards ritualization and memorialization is one of the most comprehensive and long-standing consumer research projects in funeral service. FAMIC commissioned the first study of the public’s attitudes toward ritualization and memorialization in September 1990. Subsequent waves were conducted in 1995, 1999, 2004, 2010 and 2015, making this one of the most comprehensive and long-standing consumer research projects in funeral service. The goal of this research is to better understand the personal values driving decision-making behavior as it pertains to funeral service; to learn more about attitudes toward pre-planning, cremation, monuments, cemeteries and other aspects of memorialization; and to analyze changes in attitudes over time. The 2015 wave was conducted online from March 31 – April 10, 2015 among 1,238 U.S. adults age 40+ and 305 U.S. adults age 20-39 by Harris Poll on behalf of FAMIC. The research was transitioned from phone in past waves to online in 2015. When reporting on the 2015 results, we have used an “adjusted base” – by excluding the “don’t know/refused” and “none” options (which were volunteered in the past) from the 2015 results and reporting on the revised percentages to correct for any mode-driven differences observed. The sample was weighted to ensure that the data are balanced and that they accurately represent the population nationally. Propensity score weighting was also used to adjust for consumers’ propensity to be online. Since 1991, FAMIC has been committed to making available to the public direct and open information regarding deathcare and memorialization from the leading associations of service providers and businesses. FAMIC recently launched Have the Talk of a Lifetime, a consumer education outreach effort to urge families to talk with loved ones about life, the things that matter most and how they want to be remembered when they die. FAMIC members include: Casket & Funeral Supply Association; Cremation Association of North America; Funeral Service Foundation; International Memorialization Supply Association; International Order of the Golden Rule; Life Insurers Council; Monument Builders of North America; National Concrete Burial Vault Association; National Funeral Directors & Morticians Association; National Funeral Directors Association; and Selected Independent Funeral Homes.